We are specialized in cultural tours to Myanmar, and we help you plan and supervise tailor-made itineraries according to your wishes and interests. On culture travel, leisure trips, beach holidays or trekking tours in Myanmar we will make sure, your holidays will be pleasant and enjoyable. Be it for your close familiy or on a vacation with friends. Indonesia travel tips, a choice of routes and destinations in Indonesia also combinable as tailor-made holidays in Myanmar. Visiting Myanmar/Burma you are most likely to enter the country through Yangon, and depending on the available time, you explore some of the hight-lights in central Myanmar. On a journey of 16 days you will experience the colonial style ambience of Yangon at the beginning and at the end of your trip, giving you the opportunity to explore the stunning sensual plenty and the lovable inhabitants of this extraordinary country. For a few days you will experience Pagan, the dream-like city of temples and cradle of Barmar culture at the bend of the mighty Irrawaddy river. 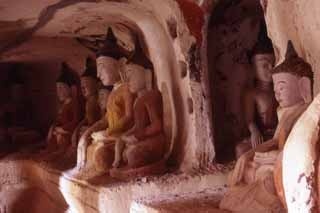 You will cruise up river to Pakkoku proceed to the Chindwin valley and witness the amazing Hpo Win Daung caves. In and around bustling Mandalay you encounter Myanmar today as well as the remains of ancient royal cities, religion, and a unique array of still performed traditional local craftsmanship. 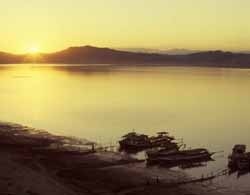 High up on the Shan plateau the serenity and peacefulness of the Inle Lake and the ethnic diversity and culture of the local inhabitants will delight you as well as the joyful boat-rides through lush vegetation. 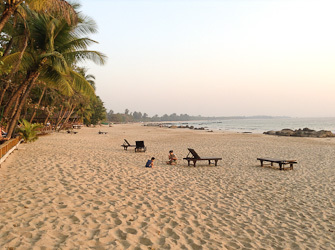 The last days of your trip you wind down on a tropical paradise beach in the Bay of Bengal before returning to Yangon. In case this is your first trip to Myanmar you would not want to miss out on some high-lights and follow the above program for the first 16 days. Before or after you would fly to Sittwe, a port at the Bay of Bangal in the remote west of the country. For a few days you explore the ancient city of Mrauk U, Rakhine equivalent to Bagan and, once a powerful kingdom, on a journey by boat up a mighty river. Pirate-idyl with remains of a once mighty sea- and trading power hidden in a maze of waterways of the Kaladan river near the border to Bangla Desh. The Temples and Chedis are partly overgrown and still in use. A traveller of the 16th century compared Mrauk U in glory and wealth with Amsterdam and London, but mentioned a better drainage system. Trade was done with all of Asia, the Middle East, Holland, Spain and Portugal. Japanese samurai were employed as body guards. If you have been to Myanmar before, you probably are more interested in particular regions. In this case I would recommend putting together an itinerary according to your wishes. A holiday of 16 days could f.e. include an excursion to Mulmein/Mawlamyaing, the old colonial capital of the British in the southern part of the country, followed by an excursion to Mrauk U in Rakhine state and a few days winding down at the beach. Another option would be an excursion to Kentung/Kyaing Tong in eastern Shan state, which would suit travellers with the taste for ethnic minorities. You should count at least 5 days and would stay in Kentung and explore the surroundings on day trips. The long closed Chin state has inspired imagination since long. It is possible to board a river steamer up the Chindwin river to Kalewa and visit northern Shin state. A shorter excursion from Bagan into the southern Chin state would be visiting Mt. Victoria, which takes about 3-4 days. Yangon is Myanmar's largest city amd commercial centre, and the country is going through a process of change, but one can hardly resist the fascinating calmness of parts of this city, still stuck in a time warp. The magical flair of imposing Shwedagon Paya, as well as the awareness and inner harmony creating atmosphere of other religious sites, and the amount of structures and edifice from the colonial time, are bound to put a spell on the visitor. The favourite excursion from Yangon is the one to the Golden Rock at Kyaiktiyo including a visit to the old royal city of Bago enroute (2 days). It is also possible to extend this trip further south to the pld British capital of Mawlamyaing, walking in the footsteps of Rudyard Kipling and George Orwell, who both were inspired here. Enroute you have the opportunity to visit the old Mon capital of Thaton and the amazing caves at atmospheric and laid back Hpa An. If you want to rub shoulders in a more remote area, we would advise a visit to Pathein in the delta region, followed by a few days on one of the nearby beaches. Since a while cycling trip are available as day trips into the rural countryside outside of Yangon. 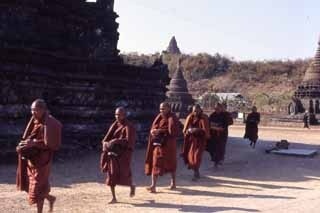 Similar trips are available in Bagan, Mandalay and on the Shan plateau. Mandalay is considered the cultural centre of Myanmar, and a few royal cities of different dynasties are situated close by. 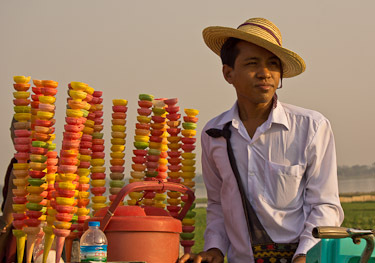 If you can manage, reserve enough time for Mandalay, because many stunning sites are to be discovered in the vicinity. Try to keep some time as well for the wide variety of local, traditional craft workshops in Mandalay itself. My favourite excursions from Mandalay are the one into the rural Chindwin Valley visiting Monywa and the fantastic Hpoe Win Daung caves across the river (2 days). The other excursion would be the one up the Lashio Road towards the Chinese border. Experience the old hill station of Pyin U Lwin, proceed to Hsipaw and eventually up to the tea plantations of Namshan. (3-6 days). ♦ Spend a few days cruising serene Inle Lake by longboat, exploring the surrounding villages and the changing markets of various ethnic groups (Intha, Pa U, Palaung a.o.). 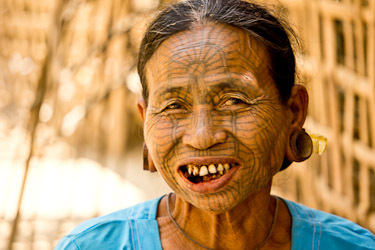 Experience Indein, sacred site to the Inthas, or hike into the villages of ethnic minorities up the mountains. A visit to Inle Lake is usually combined with a stop-over at famed Pindaya Caves. ♦ Stay with the local Shwe Palaung people at the mountains of Namshan in northern Shan State, if local standard of accommodation and food is no hinderance. ♦ Explore the village of ethnic minorities around Kentung in eastern Shan state. 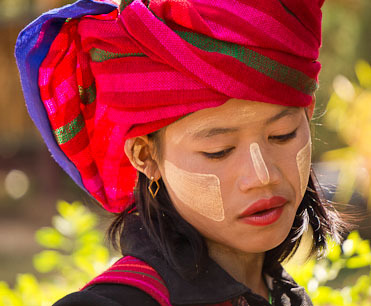 ♦ Hike from the hill station of Kalaw in 3 days to Inle Lake and stay in local villages. ♦ On my last trip I was offered the crossingfrom Bagan to Mrauk U through the closed Chin State with accommodations at local villages. Still, the demanded price was outrageous, but it seems to become possible and affordable in the near future. ♦ Regular trekking tours are only available in the extreme north of Kachin state, where near Putao mountains rise up to 6000m/19000ft height. Short visits to Bhamo and Myitkyina on the upper Irrawaddy are possible as well. ♦ Each year in January a 5 days package tour to the yearly Naga festival in upper Sagaing Devision will be offered. The classic and most comfortable way of traveling between Mandalay and Bagan and vice versa. Departure from Mandalay in the morning, arrival at Bagan in the late afternoon. A few companies operate steam ships on this route and some luxurious ships are available as well, which make the trip in 3 days with 2 night on board. Other options are cruises from Mandalay up the Irrawaddy to Bhamo or even further north, or via Monywa up the Chindwin river. It is also possible to cruise from Yangon up to Mandalay by boat, but it is quite time consuming. ♦ Ngapali Beach is a 2 miles long and wide, clean and empty beach with a lovely fishing village at the other end. This beach is situated near Thandwe at the Bay of Bengal and reachable by plane from Yangon. A far spread string of bungalow-style retreats and hotels fringe this romantic beach, most quite luxurious. Since a few years a northern beach near the airport has been developed as well, but there are plenty of rock in the sea and it missed the romantic feel. ♦ Ngwe Saung Beach (Silver Beach) is similar wide and clean but more frequented, due to its closer proximity to Yangon (5-6 hours away by car). This beach has been developed only quite recently and by now about 20 hotels and guest houses are operating. Rates and standards are in general lower than at Ngapali Beach. ♦ There are fantastic beaches in the south near Myeik, but hardly any infrastructure. The Myeik archipelago is known for Myanmar's best diving sites and development will not take long. Diving into the colonial ambience of Yangon, spending Golden Days in style at Bagan and being caught in a bewitching culture, enjoying a taste of adventure by mingling with the people of the mountains at Inle Lake, and winding down on a paradise beach towards the end of the holidays. Accommodation during the whole journey at chosen hotels or resorts with first class ambience in exclusive local style, excellent service and culinary delights. Hiring guides gives you 3 options: 1. A guide accompanying the whole trip from Yangon, 2. stationary guides at different destinations, or 3. just a car with a driver. English speaking guides are widely available, but guides speaking other languages have to be taken from Yangon. We also joyfully accept inquiries about tours or locations which are not mentioned here. This page has been created to give an overview of a few possible travel options in Myanmar.